It seems that most United States citizens want the government to take care of them, to protect them and keep them safe, no matter what the cost or no matter what the federal government has to do to accomplish it. So, we accept that the federal government keeps taking away our constitutional rights to keep us safe. How many more constitutional rights will we freely give up before we realize that our country is NOT what our forefathers wanted? Our founding fathers knew what government oppression was when they wrote the U. S. Constitution and Bill of Rights. They wrote them so that Americans would not be oppressed by their government. Remember, government of the people, by the people and for the people! (I’ll bet you have not heard that phrase in a long time.) They knew exactly what they were doing. Yet, we give up freely what they gave us without a second thought as long as the government tells us it is to keep us safe. There are many people who believe that our government is preparing to enact Martial Law now because of our economy being in the deplorable condition that it is in. At the time this article was written, our national debt is over seventeen trillion dollars, ($17,000,000,000) and rising. Yet, the United States continues to import more goods than we export. China holds more United States debt than any other country in the world. The United States continues to print money that devalues our dollar. All of these factors are speeding us toward hyperinflation. The U. S. Congress is talking about cutting funding from the Food Stamp, Social Security, Medicaid and the Medicare programs. There are those in the government that believe if funding is reduced or cut from these programs, the people that receive benefits from those programs will riot and loot in protest in all of the major cities across the United States. On Tuesday, October 14, 2008, TV talk show host Glenn Beck interviewed Mr. Peter Schiff. Mr. Schiff is the president of the brokerage firm Euro Pacific Capital. Mr. Schiff is also a respected author who wrote “Crash Proof”. Below is an excerpt summery of that interview. Mr. Schiff stated, you know, what’s going to happen, of course, is as inflation starts running out of control and prices start going through the roof, the government again is going to focus on the symptoms and not the disease. And they are going to impose price controls on energy, on food, on a lot of other things that are vital, which means shortages, which means long lines, black markets, civil unrest. If we have shortages of food, if we have rolling blackouts and people are upset and they’re hungry and they’re cold, there could be civil unrest. There could be looting, rioting and that might be the impetus for the government to declare martial law. The U. S., Department of Homeland Security has purchased over 2.2 billion rounds of ammunition. Why? They have purchased 2,700 military armored personal carriers. Why? President Obama signed the National Defense Authorization Act (NDAA) FY 2013. There have been leaked documents of the establishment of military internment camps and the indefinite detention provisions of the National Defense Authorization Act, N.D.A.A. Why? State Police, Sheriffs and local Police Departments across the country are being trained in military tactics and armed with military weapons and vehicles. Why? The federalization of local police forces is a violation of the 10th Amendment. Is the entire United States Law Enforcement community being prepared for an expected major nationwide civil unrest? Many people believe so. Recently, the Department of Homeland Security, (DHS) sponsored a self-study entitled, “Homeland Security and Intelligence: Next Steps in Evolving the Mission“, in which the Department of Homeland Security states that they are no longer concerned with foreign terrorism. They are only going to focus on domestic terrorism against the American people. So who are these domestic terrorist that are referred to above? The briefing was held at Camp Shelby in Mississippi and listed the “American Family Association” alongside domestic hate groups like the “Ku Klux Klan”, Neo-Nazis, the Black Panthers and the Nation of Islam. The instructor said the “American Family Association” could be considered a hate group because they don’t like gays. Mr. Todd Stames states, it’s not the first time the Army has accused conservative Christian groups of being domestic hate groups. Mr. Todd continues, Earlier this year, I exposed Army briefings that classified evangelical Christians and Catholics as examples of religious extremism. But do you know what Martial Law is? Do you know how Martial Law would affect you? Martial Law is when the government and military take control of the civilian population by force in the time of an emergency when the civil authorities are unable to function. Neither constitutional provision includes a direct reference to martial law. The Supreme Court has interpreted both to allow the declaration of martial law by the president or congress. A governor of a state may also declare martial law within his or her own state. The power to do so is usually granted in that states constitution. However, the U. S. Supreme Court in ex parte Milligan (1866) ruled that the military trial of civilians, when the civil courts were functioning, was unconstitutional. Sec. 15. From and after the passage of this act it shall not be lawful to employ any part of the Army of the United States, as a posse comitatus, or otherwise, for the purpose of executing the laws, except in such cases and under such circumstances as such employment of said force may be expressly authorized by the Constitution or by act of Congress ; and no money appropriated by this act shall be used to pay any of the expenses incurred in the employment of any troops in violation of this section and any person willfully violating the provisions of this section shall be deemed guilty of a misdemeanor and on conviction there of shall be punished by fine not exceeding ten thousand dollars or imprisonment not exceeding two years or by both such fine and imprisonment. Habeas Corpus, literally in Latin means “you have the body” is a term that represents an important right granted to individuals in America. Basically, a writ of habeas corpus is a judicial mandate requiring that a prisoner be brought before the court to determine whether the government has the right to continue detaining them. The individual being held or their representative can petition the court for such a writ. According to Article One of the Constitution, the right to a writ of habeas corpus can only be suspended “in cases of rebellion or invasion the public safety.” Habeas corpus was suspended during the Civil War and Reconstruction, in parts of South Carolina during the fight against the Ku Klux Klan, and during the War on Terror. The Supreme Court reviewed the issue of habeas corpus and ruled in Ex parte Merryman, 17 F. Cas. 144 (1861) (No. 487), that only Congress had the power to suspend the writ of habeas corpus. Our government thinks that we, as U. S. citizens, are dumb and that we cannot handle the truth about the affairs of state. The government does not want to alarm us, so they change the terminology that they use to report the daily news. Of course they must be politically correct. So, you think I am wrong. Did you know that during World War II, the current U. S. Department of Defense was called the U. S. Department of War? Did you know that the current Bureau of Public Affairs was called the Department of Propaganda? Being politically correct, we can no longer call private soldiers for hire, Mercenaries! When you hear our government talk about “Private Contractors” they are talking about Mercenaries. There are a lot of outer buzz words that our government uses. When we say that an area of the United States is “under martial law”, it means the military is in control of that area that it acts as the police, as the courts and as the legislature. In 1773, as a result of the Boston Tea Party, Parliament passed the “Massachusetts Government Act”, one of the Intolerable Acts. This act suppressed town meetings and assemblies and imposed an appointed government. These acts were the same as the instating Martial Law. During the War of 1812, General Andrew Jackson imposed martial law within his encampment and in a four mile radius around the camp at New Orleans, which he had recently liberated. On September 15, 1863, President A. Lincoln imposed congressionally authorized martial law. That act allowed President A. Lincoln to suspend habeas corpus throughout the entire United States. President Lincoln imposed the suspension on “prisoners of war, spies or aiders and abettors of the enemy”, as well as on other classes of people, such as draft dodgers. President Lincoln’s proclamation was challenged in ex parte Milligan (71 US 2 ). The U. S. Supreme Court ruled that President Lincoln’s imposition of martial law (by way of suspension of habeas corpus) was unconstitutional. In the above case, Lambden Millgan was arrested as a Confederate sympathizer. Milligan was tried by a military commission and sentenced to die by hanging. After his conviction, Milligan petitioned the Circuit Court for habeas corpus. He argued that his arrest, trial and conviction were all unconstitutional. On October 9, 1871, Chicago Mayor Roswell B. Mason declared a state of Martial Law and placed General Philip Sheridan in charge of the city because of the great Chicago Fire of 1871. Martial Law was lifted after a few days. In 1892, at Coeur d’Alenem, Idaho, rebellious mine workers blew up a mill and shot at strike breaking workers. The explosion leveled a four story building and killed one person. The mine owners asked the governor to declare martial law, which he did. A request was also made for federal troops to back the guardsmen. Over 600 people were arrested. In 1914, imposition of martial law was enacted in the Coal Field Wars in Ludlow, Colorado. President Wilson sent in federal troops, which ended the violence. During the years of 1920 thru 1921, because of the incidents of the West Virginia Mine War, martial law was declared for the entire state of West Virginia. By the order of Governor Cornwell, federal troops were sent to Mingo County to handle the striking miners. The Army officer in charged, removed the constitution. He did not allow any kind of assembly. He ordered his soldiers that if they found any miners on the streets, those miners will be immediately taken custody and imprisoned. Miners were arrested, jailed and released without any type of a trial because the jails were overcrowded. Federal troops were sent three times to suppress the activities of the miners in the West Virginia Mine War. In 1931, Texas Governor Ross S. Sterling sent Texas National Guard troops into east Texas oil fields to force compliance with limits on the production of oil and an increase in the minimum number of acres required between oil wells. In 1932, the Supreme Court invalidated Governor Sterling’s use of martial law, holding that it violated the constitutional due process rights of the property owners (Sterling v. Constantin, 287 U.S. 378, 53 S. Ct. 190, 77 L. Ed. 375 ). In 1934, California Governor, Frank Merriam, placed the docks of San Francisco under martial law. The reason was because of “riots and tumult” resulting from a dock workers strike. The Governor threatened to place the entire City of San Francisco under martial law. On December 7, 1941, Hawaii was placed under martial law following the Japanese attack on Pearl Harbor. After the war, a federal judge for the island condemned the conduct of martial law. The federal judge stated, “Governor Joseph B. Poindexter declared lawfully martial law. The governor also suspended the writ of habeas corpus. However, the Army went beyond the governor and set up that which was lawful only in conquered enemy territory namely, military government which is not bound by the Constitution. And they … threw the Constitution into the discard and set up a military dictatorship. The Military Governor closed all courts and the military was authorized to make arrest, try and convict persons. Martial Law was lifted on October 24, 1944. In February, 1942, the War Department appointed General John L. DeWitt to carry out martial law in the states of California, Oregon, Washington and the southern part of Arizona. In March or 1942, General J. L. DeWitt announced that the entire Pacific Coast of the United States would be subject to additional martial law measures. In Korematsu v. United States, 323 U. S. 214, 65 S. Ct. 193, 89 L. Ed. 194 (1944), the court justified the random interment (imprisonment) of more than 110,000 Japanese Americans during the war. In June, 1954, Alabama Governor Gordon Persons declared martial law in Phenix City (this is the correct spelling of Phenix) after Albert Patterson, a nominee for state attorney general in Alabama, was shot to death on a street in Phenix City. Governor Persons sent General Walter J. “Crack” Hanna and the Alabama National Guard to take over the city. General Hanna appointed a military mayor and troops took control of the county courthouse and city hall. The troops physically removed certain officials from the courthouse and city hall, seized gambling equipment and revoked liquor licenses. On May 21, 1961, Alabama Governor Patterson declared martial law because of the “Freedom Riders”. In May, 1970, Ohio Governor James Rhodes declared limited martial law by sending the National Guard troops to contain a Kent State University protest against the Viet Nam War. Four protestors were shot and killed by the troops. In a case brought by their survivors, the Supreme Court held that the governor and other state officials could be sued if they acted beyond the scope of state laws and the federal constitution (Scheuer v. Rhodes, 416 U.S. 232, 94 S. Ct. 1683, 40 L. Ed. 2d 90 ). On August 29,2005, after Hurricane Katrina hit the City of New Orleans, the city was placed under a, “State of Emergency” by the Governor of Louisiana. Louisiana does not have “Martial Law” in its Constitution. This state of emergency allowed the governor to suspend laws, order evacuations and limit the sales of items such as alcohol and firearms. This did not stop the federal government from sending in 15,000 federal troops and National Guard personal that patrolled New Orleans. Have Mercenaries ever been recently hired by the U. S. Government to run active operations within the United States of America? Yes they have. The approximately 12 hours after Hurricane Katrina hit New Orleans, La. the looting and lawlessness started. Also, the looting and unknown persons shooting from windows and roof tops could not be responded to by the New Orleans Police Department. Many of the members of the New Orleans Police Department deserted the City of New Orleans and never came back. 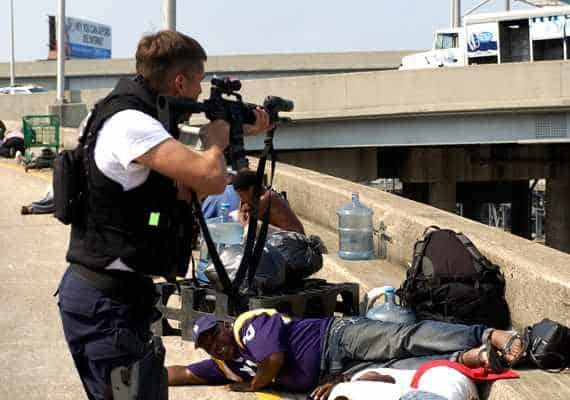 The New Orleans Police Department was completely overwhelmed and none of the federal government agencies were able to get their act together in a timely manner to assist in controlling the violence in the City of New Orleans. The federal “Department of Homeland Security” signed a contract with what amounts to be a private mercenary group or as the U. S. government likes to call them “Private Contractors”, “Blackwater”, to supply a force of approximately 150 men to regain control. The private contractors “Blackwater” sent to New Orleans were dressed in full black combat B.D.U.s with full combat gear including loaded M-16 rifles. 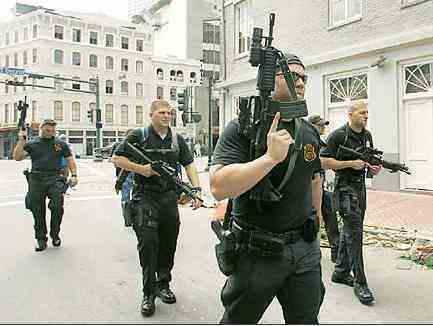 The Department of Homeland Security hired Blackwater to patrol the streets of New Orleans. (See below photo) “Blackwater” claimed to have authorization to shoot if necessary. Blackwater, at first, did not have a contract and was paid almost $250,000 a day by the U. S. Government. I always thought that it was illegal for any Mercenary group to run active operations within the United States of America! Yet they did after Hurricane Katrina in New Orleans, La.! Martial law was never declared during or after Hurricane Katrina and the term does not exist under Louisiana State Law. Furthermore martial law, or the suspension of habeas corpus, cannot be declared federally without the approval of congress and even then only in cases of rebellion or invasion. Individual states and the federal government can declare a state of emergency which is similar, but does not throw the Constitution out of the window. There is a famous piece of video tape that made the national news. The video tape was shot by a news crew in downtown New Orleans days after Hurricane Katrina hit. A uniformed member of the U. S. Army was sitting in an open hatch of an armored personal carrier holding an M-16 rifle at the ready. There was a thirty (30) round magazine in his M-16 rifle. Army Lt. General Russell Honore yelled at that soldier to put down his M-16 rifle. 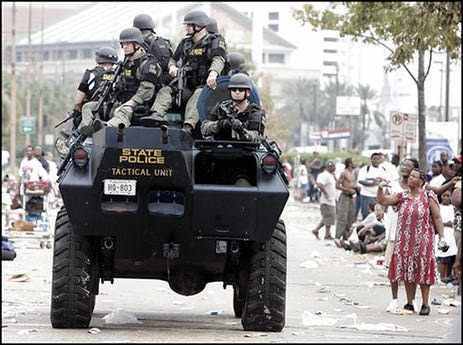 After Katrina, New Orleans Police Were Told They Could Shoot Looters by their supervisors! New Orleans Police Lt. Dwayne Scheuermann aims his gun on the Claiborne Overpass in New Orleans on Sept. 1, 2005. PART II will be published tomorrow………. Where is my hyperinflation? I bought cans of survival food but they only have a 25 year shelf life and time is running out. Nice piece, except for one inaccuracy. “Hurricane Katrina” DID NOT hit New Orleans; New Orleans was hit by the levee break after the levees absorbed peak water load from the rain bands outside Katrina. Hurricane Katrina went straight up the middle of Mississippi. I do wish people would state this correctly, both as an honorarium to the people of Mississippi who suffered and overcame, and so that history does not wrongly remember this terrible event. Hurricanes are defined by extremely strong winds and heavy rains. I had a personal friend who was visiting in New Orleans when Katrina was about to hit. No flights out; she got out riding in the back of a pickup driven by a Good Samaritan as Hurricane Katrina was about to hit. She says that New Orleans was hit by Katrina. And that is what I remember too. Leevee breaks did not cause the roof of their football dome to be torn off. Many, many homes were damaged by high winds and not flood waters. Tens of millions of people were affected by Katrina along the Gulf Coast. It was ALL Katrina related, but the largest city that got hit the worst was New Orleans as I remember it.